Shelly-Ann Fraser-Pryce’s rise to glory has not come easily for her. The Jamaican track and field sprinter had a torrid time growing up as she was born in a poor community. Her struggles started early in life as her mother, Maxine, was a former athlete herself but a single parent. Her mother would work as a street vendor but could not earn enough to sometimes even buy dinner. But she said that her mother somehow managed to get her to study at a good school where she became a sprinter. Her first win in sprinting came at Jamaican school’s championship when she won the gold in 100m, aged just 16 in 2002. Ever since that day, the 29-year old never looked back. She went on to win a gold medal in the Central American and Caribbean Junior Championships in Athletics. But she was never considered as a sprinter meant for the 100m individual event. In 2007, she was in the Jamaican World Championships squad but only for the relay event. However, she did manage to qualify for the Beijing Olympics in the individual events. She ascended to an Olympic gold medal in China when she won the 100m sprint. The talented sprinter became the first woman from the Caribbean to win a 100m gold medal at the Games. The following year, she created history when she became only the second woman to hold both the Olympic gold and the World Championship gold in 100m racing when she won in the IAAF World Championship in Berlin. She also went on to win a gold medal in the 4x100m relay in that championship and bagged gold medals in the 100m, 200m and the 4x100m relay events in the 2013 Beijing Championships. Whereas, in the 2012 London Olympics, the sprinter retained her gold in the 100m category and won silver medals in the 200m and the 4x100m relay events. 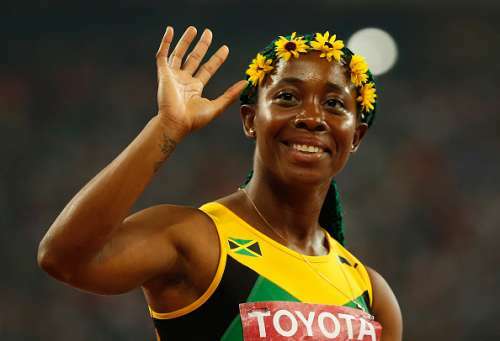 Due to her accomplishments on the track, she also became the second woman sprinter from Jamaica to win the IAAF World Athlete of the Year since Merlene Ottey had won it in 1990. The 29-year old also holds the record for winning both the Olympic gold and the World Championships gold in 100m on two separate occasions. If she wins in the Rio Olympics, she will become the first woman to bag a hattrick of Olympic golds in 100m sprinting. She has been in good form ahead of the Rio Olympics, where she will be participating in her third Olympic Games. She had started preparing for Rio with a win in the 4x100m relay event at 2014 Glasgow Commonwealth Games and then won her 100m and 4x100m gold medals in the 2015 World Championships. The Pocket Rocket, as she is nicknamed, will be facing competition from the likes of American Tori Bowie and Dutch Dafna Schippers. The latter had finished in the second spot behind Fraser-Pryce and the former had finished third in the 100m race in the championships. Jamaica also has the likes of Elaine Thompson, Veronica Campbell-Brown and Natasha Morrison. This indicates that Jamaica does not only have a chance in the individual category but also in the relay events. Fraser-Pryce’s journey so far has been that of courage and determination to succeed in tough circumstances. But when she steps foot on the track in Rio, she will not be the struggler, she will be the favorite to retain her gold medal in the 100m event. She will be the dominator.